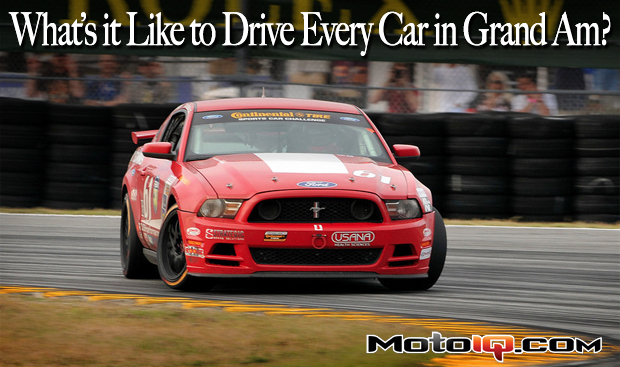 What’s it Like to Drive Every Car in Grand-Am? What's it Like to Drive Every Car in Grand-Am (From Street Tuner to Daytona Prototype)? First off, what is Grand-Am? Grand-Am Road Racing is owned by NASCAR and was created in 1999 as its Road Racing branch which rivals the American LeMans Series as the top level of sports car racing in the country. Grand-Am is considered one of the world's most competitive road racing organizations with close racing and packed fields in each of its two series and four classes. The premier Rolex Series which features the Daytona Prototypes (DPs) and GT cars run in races such as the 24 Hours of Daytona and the 6 Hours of Watkins Glen. The equally if not more competitive Continental Challenge Sports Car Series “CTSCC” contains packed fields that can reach over 100 cars with the Gran Sport (GS) and Street Tuner (ST) class. The CTSCC races usually precede the Rolex races and over the years have included some 3 and 6 hour races but now have consistent 2.5 hour length races. Now the fun part, what is it like to drive these cars? I really like racing in Grand-Am. The majority of the cars in the 4 classes are production-based unibody cars which undergo slight to extensive modifications to become the racecars you see on TV. For ST and GS, they are pretty much street cars with roll cages and bolt-on items so they drive like modified street cars and you can really get into heated battles on the track that I and I'm sure many others have bench raced in our heads. Thinking about how certain cars would stack up to others in power, handling, and braking. They are the easiest to relate to for most people. In the GT series, there are some tube-frame cars but many like the Porsche 911 GT3, Ferrari 458 Italia, Audi R8, Corvette, and others are still unibody cars albeit with more modifications and then the DPs are just a blast to drive; like a video game. My time-attack background driving many different types of cars with various drivetrains, power, handling, and levels of modification has no doubt been beneficial to my career to help me adapt to new racecars. But I'll now get into the details of the car specs and what it's like to race them now. ST cars weigh 2,300-2,800lb; make ~200-300hp and run 225/45-17” Continental Tire racing slicks. The field consists of BMW 128i & 328i, Mazda MX5 & Mazdaspeed 3, Mini Cooper S, Kia Forte Koup, Honda Civic Si, Ford Focus ST, VW GTI, Porsche Boxster, and many more. They are powered by high-revving 4-cylinders, Turbo and supercharged 4-cylinders, Inline 6s, and even a rotary. I started my Grand-Am career driving these cars from at the time BMW Z3 Coupes, Mazda RX8s, and Acura TSX & RSXs. With very few modifications allowed and a 3.5” ride height, the ST class really reflects the Street class time attacker who has suspension, exhaust, and aggressive street or R-comp tires. These cars are relatively lower powered momentum cars that really remind me of the bread and butter Time Attackers who bring their daily drivers to the track and compete. At Daytona the series fastest track, speeds can reach over 140mph –similarly to AutoClub Speedway. If I had to guess, an ST car might be in the 1:58-2:01 range at BW. 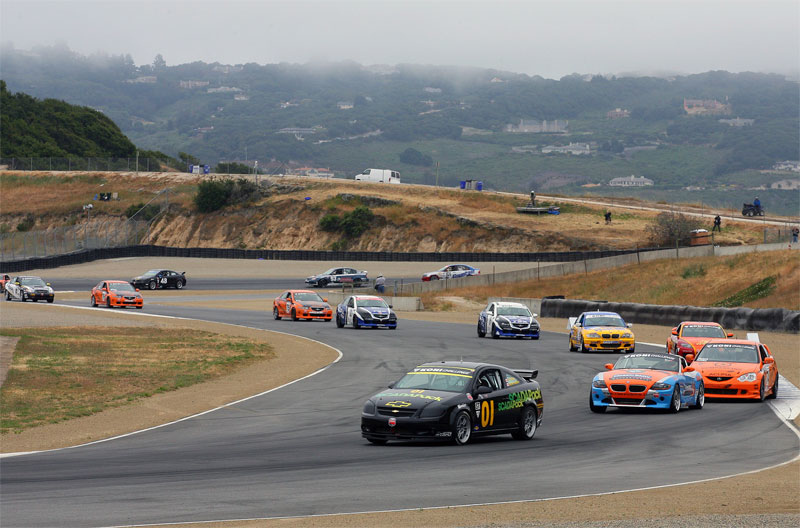 Laguna Seca is the only west-coast Grand-Am venue. 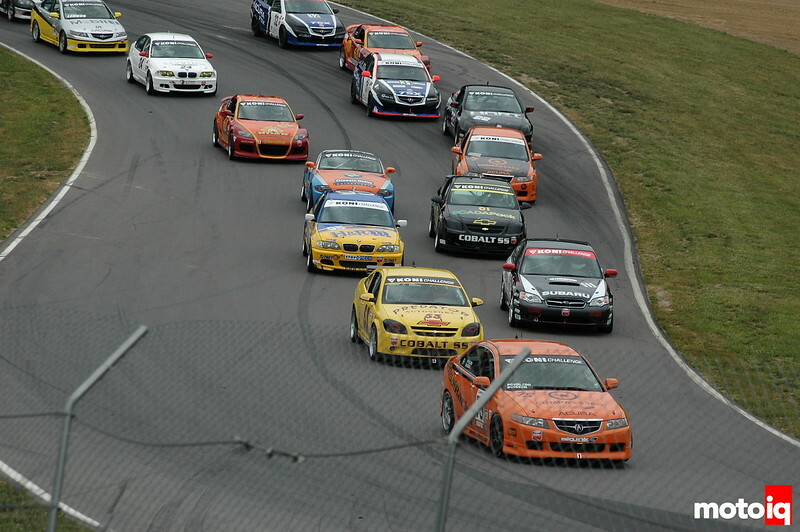 Here we see the ST field entering Turn 3 with a FWD Chevrolet Cobalt leading, RWD BMW Z4 behind, and back in Turn 2 you can see the AWD Subaru. This class has the most diverse form of drivetrains mixed in with both Supercharged and Turbocharged vehicles making for a very unique racing conditions. I really like driving these cars. Because there is not a lot of power and a decent amount of grip, they require a driver to be very precise because any mistake can greatly hurt your lap time and finishing position. The racing is often very close like you would see in a spec miata race, but with vastly different power, weight, and handling abilities, there is always action and passing going on. You really have to watch the races closely. The lighter Miatas don't have the power or top speed, but they are great under brakes and have high cornering speed; while the heavier and faster Mazdaspeed 3s have the straight-line speed but you really have to manage your brakes or you will burn down the stock brake system before the race is over. 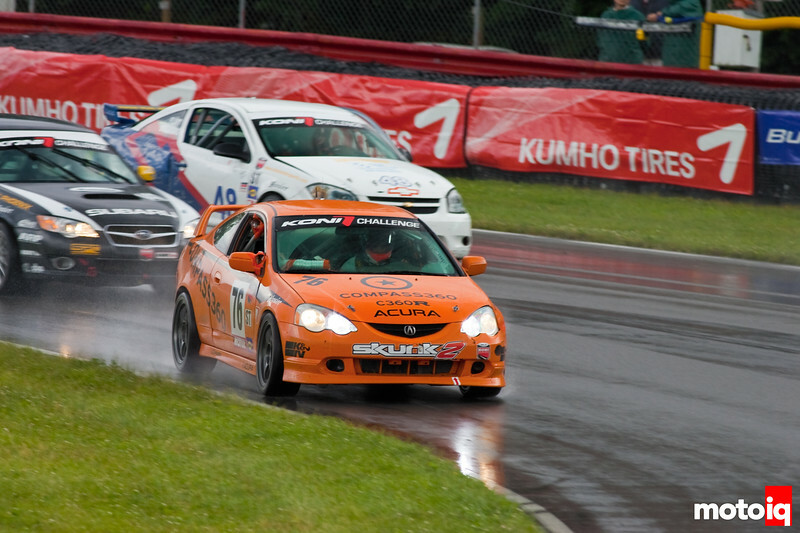 Mid-Ohio is a popular destination for the CTSCC. As you can see, there is no clear outright success of one drivetrain over another. This photo was from 2007. In the recent years, the Mazdaspeed3 and Mazda MX5 have replaced the RX8, while the TSX has been replaced by the Honda Civic Si. BMW continues with their 3-series running the newer E90s. The front-wheel drive cars used to skate around by over-stiffening the rear suspension, but in recent years and with proper development, top teams have gotten the cars to rotate and put the power down well without simply loosening the car up and they seem to hold their own just as well as any RWD car. They can also understeer and push severely for those who don't have the patience to let the car rotate mid-corner and tire management is important since the front tires do everything. Typically FWD cars have worse brakes but slightly more power. Driving the RWD cars are fun and more traditional due to the balance but without a lot of power, any oversteer just kills your cornering speed.